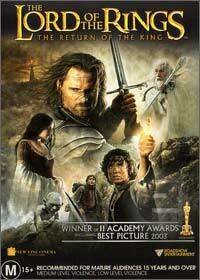 The third and final instalment of the acclaimed trilogy, faithfully reproduced by Peter Jackson. Winner of 11 academy awards, one of the biggest blockbusters of all time, and over 3 hours in length. No matter how you look at it, this movie is HUGE! Being the third, and final in the series also means it needs to be the most thrilling and emotional. Luckily it doesn't disappoint! I'm not going to go into the storyline very deeply at all in this review, because simply, if you haven't seen the first two, you're not likely to want to see this either. The other reason is that it's based on one of the best know books in history (save for the bible), and lovingly reproduced at that. By all means though, if you haven't seen the first two, please do yourself a favour and watch them, they are fantastic. After doing so you'll be pleased to know the best is yet to come. That's right, the third movie, is not only the longest, but also by far the best of the three. It is of course based around Frodo and Sam's quest to destroy the ring, and the remainder of the Fellowship's fight to keep Middle Earth alive. There are less new characters to get to know in this one, and as such you're far more in touch with what's going on, and in a more emotional state when something does inevitably go wrong. This is about as good as you could want a trilogy to end, there's tons of emotion, a good dose of thrills and scares, and most importantly, there's a fantastically well done conclusion to all the stories involved. If you haven't seen it yet then you really are missing out on probably the best trilogy we are likely to see for many a year, possibly ever again. J.R.R. Tolkien would most definitely be proud of the work that was done on his most beloved books, I really can't praise it enough. To which you might ask, "Why the hell didn't you give it 10/10 then? ", the answer to that is simply because the story is not complete yet. I'm not talking about the Hobbit, I'm referring to the extended edition that will be out later in the year, adding a rumoured hour or more footage. In the past the extended editions have eclipsed the regular version, and I suspect the same deal will occur here. Wow, the picture on this disc is superb, it looks so crisp and wonderful that it makes me rethink all my past conceptions on what a good picture was. About the only complaint I have is the being in 2.35 widescreen, unless your the proud owner of a projector or large widescreen TV (like a plasma for example), must of the beauty will be lost. This is not of course a problem of the disc, it's just so good that you'll seriously want to go out and buy a new TV to make proper use of it. Like the video there's nothing to fault, everything is just right. The surrounds and subwoofer are used perfectly and the stage across the front channels sounds just wonderful. The final battle is truly something to behold, if you have a good sound system then please, do yourself a favour and turn it up. You'll be rewarded with an experience that can rarely be matched, even in a cinema. For those of you who are jealous of friends or neighbours with a good system, it may be advisable not to watch this disc there, you're likely to leave crying. There's an extensive list of extras listed below, and it's quite some list to be certain. Sure to treat you to hours more entertainment after you watch the movie. Before I go on though, I should mention the reason I only gave the extras an 8/10. It's for the same reason as the feature, being that in the near future we'll be blessed with the extended edition of Return of the King, and if the past two are anything to go by, it's likely to be one of the most comprehensive collections of extras imaginable. Well that and I thought it deserved an 8 anyway. The in depth programs in total go for about 2 hours (2 30 minute doco's, and an hour long National Geographic doco), of the three the National Geographic's is by far the best, but the other two are still great to have. There are 6 featurettes, basically a bunch of shorter doco's that again are not superb, but it does add information that you would miss if it wasn't there. After that there are trailers, including a cool supertailer, for the trilogy, not quite a new trailer, and not just a pasting together of the old three. Then there's the trailer for the videogame, not entirely necessary, but I guess fans of the games will be looking forward to it. So in total you've got around 3 hours of extra entertainment there, not too bad at all, but like I already mentioned, just wait till you see the extended edition.